The medical field was not built to accommodate the nurse. The role of nurses has always been one where a level of submission is required. Nurses must follow orders from doctors and other nurses. Doctors sometimes do not appreciate nurses and nurses often fight amongst themselves for dominance. This negative aspect of the medical working atmosphere forces many nurses into a shell where they are content with taking orders. They become used to absorbing any mistreatment that they endure, and accepting it as their reality. Bottling up this negativity usually leads a nurse to become so fed up that they no longer want anything to do with nursing. This is where redirecting their careers into Legal Nurse Consulting becomes a great solution. Once a nurse decides that they are ready to become a Legal Nurse Consultant, they choose a course, complete the training, and feel like they are ready to get started, but then, hit one major roadblock. All those years of submission force the nurse to develop a lack of confidence. Without finding their confidence again, these newly certified Legal Nurse Consultants never understand their true value to the legal field. Confidence is crucial for success. When you have confidence in your abilities and knowledge, it will show in the way you speak and present yourself. When you exude confidence and believe in yourself, attorneys will easily believe in you as well. Avoid negativity and think positively Negativity comes in many forms from many different people. People are negative towards others for many reasons. The main reasons are jealousy and dominance. If someone is jealous of what you have to offer, their jealousy will almost always show in the form of negative acts towards you. Other people, for various reasons, feel that it is necessary to impart their dominance upon you. If you resist, more negativity will result. How do you combat all this negativity? Use the opposite of negativity: positivity. A positive attitude will always help you rise above negative people. You will feel better about yourself and you will make yourself look better. Choose to address or remove all those negative influences from your life and more self-confidence will result. Smile Smiling is a simple thing. Studies show that forcing yourself to smile can create a happy feeling-even if it is a fake smile. Forcing yourself to smile when you are not in a good mood will not only help cheer you up, but it will also improve the response you receive when you react with others. People are much more receptive of someone who offers a welcoming smile than someone who wears a melancholy grimace. Your self-confidence will grow as interaction with others becomes more enjoyable and they become more receptive of you. Laugh Laughter can be extremely powerful. It can brighten your day, bring people together, and relieve stress. Laughter is one of your most useful tools when suffering from a lack of confidence. It can force you out of any shell you are stuck in without you even realizing. Laughter can be even more powerful when done with others. Find a source of laughter and utilize it on a daily basis. It can be a person, a publication, or a video. When you laugh with others, you are building a personal connection with them. When you laugh more often, you will feel better about yourself. Find a happy thought When you find yourself backing down or cowering from a lack of confidence, find your zone. Think of a place where you are most comfortable and place yourself there. Once you find your comfort zone, your obstacles will become much easier to conquer. Most likely, a smile will also result. Be proud of your accomplishments, embrace failures Everybody has accomplishments and failures. Focus on your accomplishments and embrace your failures. After all, like Veronica says: "You have not succeeded if at first you have not failed." The word "failure" comes with a negative connotation. Instead, failures should be thought of as "learning experiences". They help you become a better person and teach you valuable lessons. Everyone has failures. Some people are able to use them to their advantage, while others obsess on them or fail to learn from them. Don't let your failures define you. Instead, your defining moments should be what you learned from your failures, and how you applied those lessons to the future. Set reachable goals and work to achieve them Without goals, you have nothing to work towards. From goals you will develop drive and motivation, because you will have something that you feel is worth working towards. Working hard towards a goal will give you feelings of pride and excitement. You will have something to work towards on a regular basis and you will feel great joy when your goal is accomplished. Even if you do not reach your goal, you can feel proud of the effort you put forth. At this point, you will have the desire to set another goal and achieve it. This cycle of setting and achieving goals is the mindset you need to achieve success in business. Prepare yourself with necessary skills Dedicating time and resources to the betterment of yourself is a great way to increase your self-confidence. As you reach a new level of education, you will be proud of your accomplishment and will be eager to put it to work. Your confidence in your newfound knowledge will translate into confidence in yourself. When you are able to put your knowledge to work effectively, your confidence will continue to grow even more. Seek acceptance only from yourself Seeking approval from others is an easy way to decrease your self-confidence. When the acceptance that they are looking for does not come, many people will then experience feelings of failure. Find comfort in yourself. Know that nobody's acceptance of you matters as much as your acceptance of yourself. With this in mind, carry out your daily routine and do not feel that you must justify yourself to anyone else. Proudly take responsibility for your actions, and your mistakes. Follow your own path without being coerced into other directions where you don't want to be. Don't make decisions in your life that are intended only to impress others. Don't be afraid to give your opinion. Be who you are and be comfortable with it. Learn from mistakes and improve For some people, learning through trial and error is the best way. Others may prefer book learning. We suggest a combination of both. Learning through action is very effective. When you make a mistake, take what you learned and use it to your advantage. If somebody is providing you with negative feedback, find the positivity within their negativity, and use it to improve for next time. Finding the positive side to a mistake or problem will help you to become more comfortable when accepting new challenges. Fear of failure often paralyzes people and prevents them from moving forward. After you learn how to recover from mistakes and failures in a positive manor, accepting new challenges will become enjoyable for you. Be Healthy You will be amazed at the difference some healthy eating can make. Add more fruits and vegetables to your diet and avoid junk foods, restaurant foods, fast foods, and fried foods. Drink more water and avoid sodas, diet drinks, and drinks with sugar added. If you really want to step it up a notch, decrease white carbohydrates such as breads and pastas. Be sure to control your portions. These simple steps will allow you to lose weight and feel better about yourself. The influx of healthy foods will help you to gain more energy and feel better. Self-confidence is extremely useful and important when starting your career as an Advanced Legal Nurse Consultant (ALNC), or any other career. It contributes to positive first impressions and improves how people think of you. Most importantly, it improves how you think of yourself. It helps you to dig yourself out of the whole that the medical field has forced you into. If you are interested in a career as an Advanced Legal Nurse Consultant, but feel you lack the necessary self-confidence, don't worry. The confidence you need can be learned. As you complete the LNC STAT course, you will probably feel your self-confidence growing within you. The LNC STAT course imparts tools and techniques that allow you to realize that you can really achieve your new goal. LNC STAT is not just training-it is a transformation. It can transform you from a typical nurse who does not always receive the respect they deserve, to a self-confident business person who demands respect for their knowledge and worth. 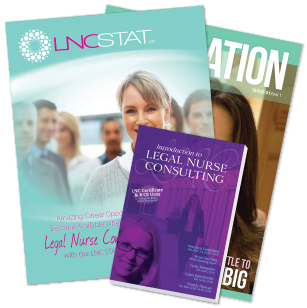 Legal Nurse success is not as impossible as you think; you just have to be willing to learn the LNC STAT system and apply the effort to put it to work. Self-confidence will be a direct result when you secure your first case and others after. Complete the LNC STAT Course to help build your self-confidence and transform your nursing career into a successful one. Click Here to get started.